How to get the toilet working when you are boondocking? Do you just put the water in? Thanks for any information you can give me! 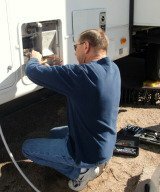 You probably have a fresh water tank in your RV with a water pump. You flush the same if you were on city water. Depends on how long you boondock you will need to refill your fresh water tank.